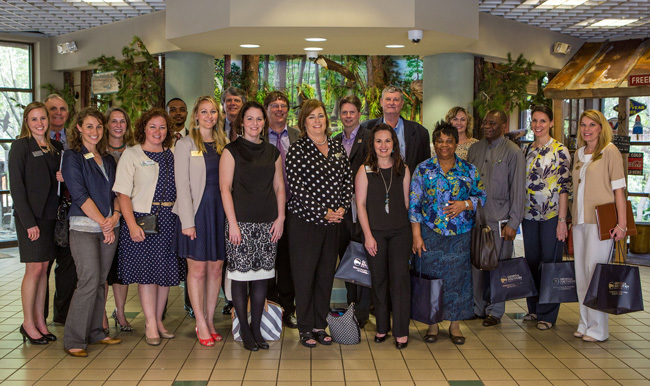 Statesboro, Ga. — Georgia Southern University welcomed an international delegation to campus this week. Members of the Consular Corps., including delegates from Brazil, Quebec Canada, Canada, Hong Kong, Germany, Italy, Nigeria and United Kingdom met with community leaders of the regional economic development authorities of Bulloch, Candler, Emanuel, Evans, Jenkins, Long, Screven and Tattnall counties. Guests were given a tour of campus highlighting the Ted Smith Family Football Center and the Allen E. Paulson Stadium, Shooting Sports Center, Manufacturing Engineering Lab and the College of Engineering and Information Technology. They also were treated to a reptile show at the Center for Wildlife Education at Georgia Southern. The tour, organized by the World Trade Center Savannah (WTCSav) and Georgia Power initiative, was part of a three-day visit for the purpose of familiarizing the Consular Corps with the coastal region of Georgia. Georgia Southern University, a public Carnegie Doctoral/Research University founded in 1906, offers more than 125-degree programs serving more than 20,500 students. Through eight colleges, the University offers bachelor’s, master’s and doctoral degree programs built on more than a century of academic achievement. Georgia Southern is recognized for its student-centered and hands-on approach to education.www.GeorgiaSouthern.edu.